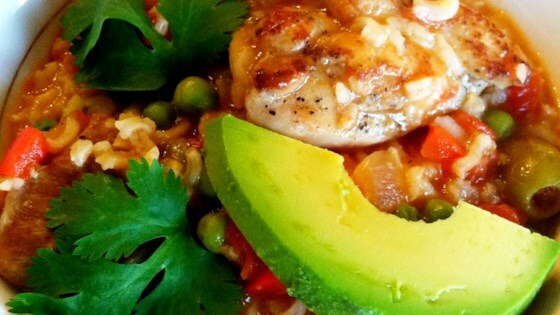 "This traditional Puerto Rican chicken and rice stew is filling and flavorful." Season chicken thighs with black pepper and adobo seasoning. Heat olive oil in a large pot over medium-high heat. Cook and stir green pepper, red pepper, onion, garlic, and tomato paste in the hot oil, until the vegetables have softened slightly, 3 to 4 minutes. Remove vegetables from the pot and set aside. Pan fry chicken in the pot until browned, 4 to 5 minutes on each side. Return cooked vegetables to the pot along with rice, diced tomatoes, chicken broth, bay leaf, and red pepper flakes. Bring to a boil, then reduce heat to medium-low and simmer until rice is tender and chicken is no longer pink inside, about 20 minutes. Stir in peas and olives and cook for another 5 minutes. Remove from heat and discard bay leaf. Stir in cilantro and serve. When I'm cooking for myself, I love to make this a bit hotter with fresh habanero or jalapeno slices. Made it exactly as recipe stated and it was very good! I agree with the other reviewers that the olives and cilantro male this dish.